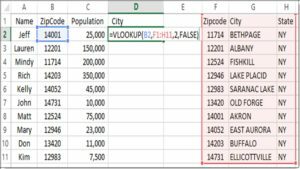 In this post, I will provide a detailed example of how the Excel VLOOKUP function operates, using the EXACT match criteria. 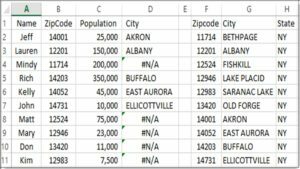 The formula looked up value in cell B2 of Table A “14001” in range F1:H11 (Table B), scanning Column F for the match. 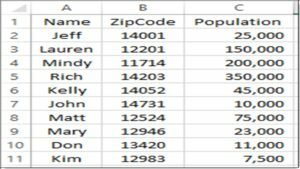 It found ZipCode “14001” in row 8, cell F8. 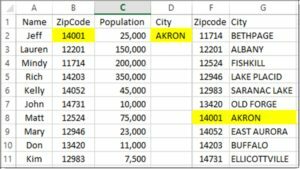 Then, the formula returned the column index “2” of the lookup table, which was the City “AKRON”. This was an EXACT match for ZipCode “14001”. When you copied the formula down, the “Lookup Table Range” automatically adjusted to “F3:H13”. 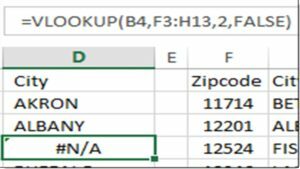 So in our example, the zip code “11714” was not found in Table B, because the formula started looking in column F at row 3, missing the match. 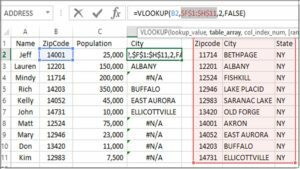 To solve this problem, you should use either a Named Range or an absolute lookup cell range. 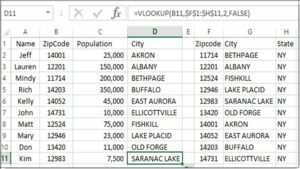 The quickest way is in your original formula, highlight the “Lookup Table Range” in the formula editor and press the F4 key. 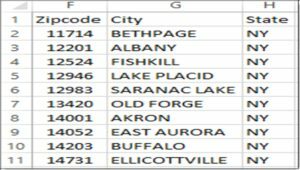 This will make the cell range absolute (will not change) as you copy the formula down to lookup the rest of the ZipCode values.